Purple Stripes: The purple on the flag stands for peace. Teal/Aqua Stripe: This stands for the ocean the nation longs to be by and also the sky. Purple Crescent Moon: This stands for royalty. 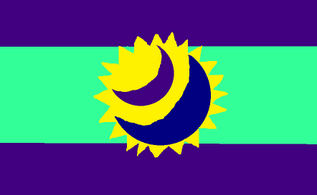 Blue Crescent Moon: This stands for the loyalty of the citizens.